Furthermore there are very few wind tunnels in the world that are capable of accurately reproducing the conditions for a full size aircraft in flight. The more accurate the design of the aircraft models before going to testing, the less new models need to be made for the wind tunnel. Again this does not only save a considerable amount of money and time, it also allows for entirely new kinds of design to be explored, including the use of different, more flexible materials. That is why the AeroGust (Aeroelastic Gust Modelling) Project, funded by the European Union, has been set up. Its goal is to achieve better understanding of the aircraft/gust interactions early in the design process, by crafting new efficiencies and higher accuracy in the simulation stage. 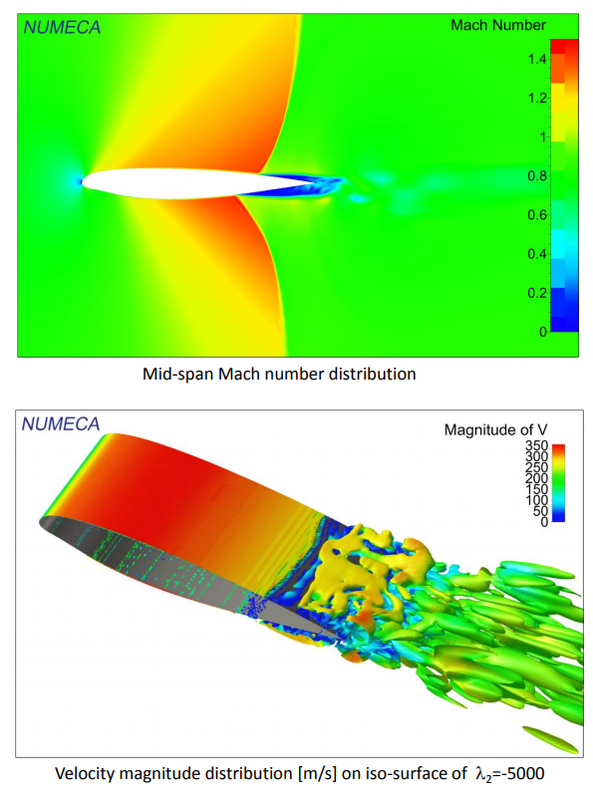 Numeca International is proud to be one of the partners in the project, providing expert knowledge and state-of-the-art tools for Computational Fluid Dynamics (CFD) simulation. CFD is crucial in accurately predicting aerodynamic performance, in this project producing precise and detailed models of aerodynamic gust flows around the aircraft structure. NUMECA’s FINE™/Open was used to model how the airflow interacts with the wing of an aircraft. Using this virtual prototype an unlimited amount of variations in any part of the design can be tested by simply varying input, boundary, geometrical parameters etc. The objective of the AeroGust project is to generate new computer codes that will streamline the processes of the simulations and tests. Besides aircraft design, the AeroGust project can also benefit the industry of wind turbine design: Today the distribution of wind farms is restricted by the fact that strong wind variances and gusts create large loads on the turbines. If we would be able to predict the impact of those gusts more accurately, the structures could also be placed in more challenging regions like for example the Arctic Circle and the tropics.